Beginning next week, I’ll be posting contributed summer reading lists for families every week until Labor Day. A month ago I invited artists, artist-parents and families to send me their top 10 suggestions for great summer reads, and I’ve got a fantastic collection started. 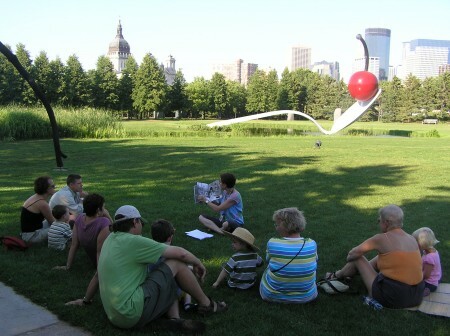 One book from every list will be stocked in the Open Field tool shed (the Walker’s version of a lending library for books, backyard games, radios, etc), so come read together on our grassy backyard! 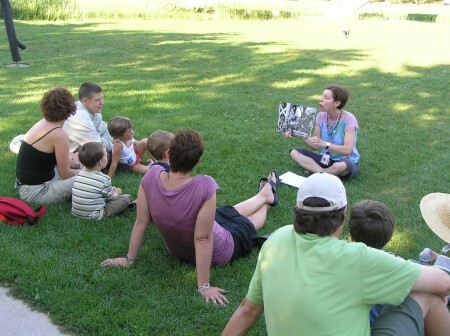 Walker Art Lab Coordinator, Ilene Krug Mojsilov reads to participants in the studio class, Once Upon a Garden.